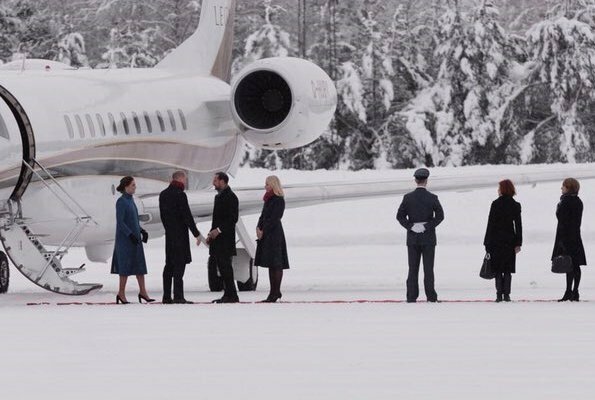 The Duke and Duchess of Cambridge arrived in Norway and were welcomed by Crown Princess Mette-Marit and Crown Prince Haakon at Oslo Gardermoen Airport. 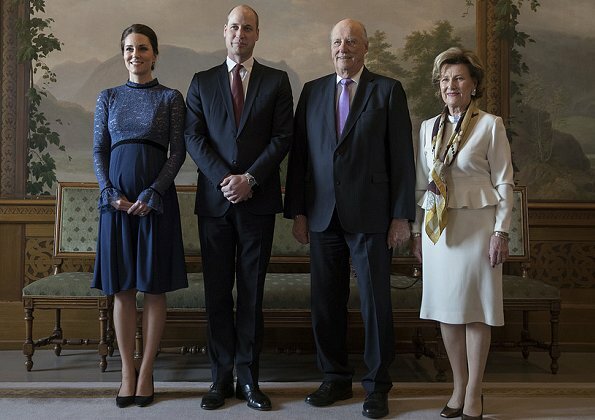 Upon the invitation of King Harald and Queen Sonja, the Duke and Duchess went to the Royal Palace where they will stay. 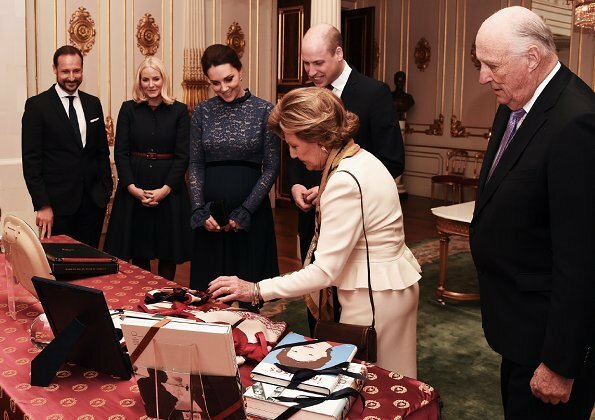 The Duke and Duchess were welcomed by King Harald and Queen Sonja with an official ceremony. 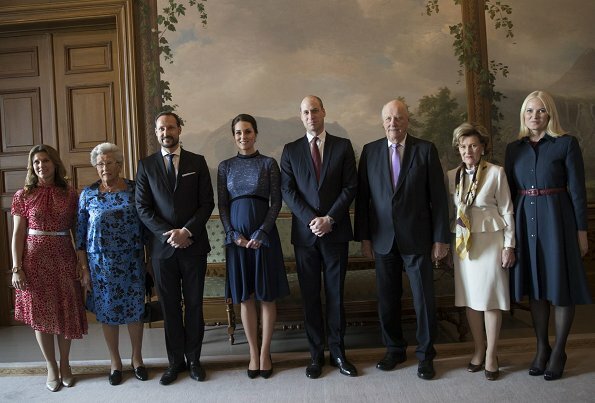 The Duke and Duchess attended a lunch which was also attended by Norwegian royal family members. 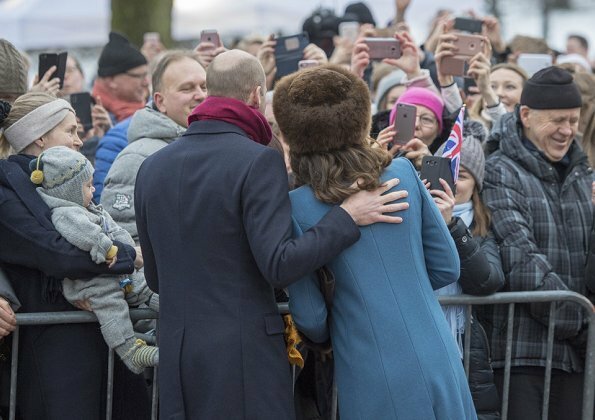 After the lunch, the Duke and Duchess visited Sculpture Park in the Palace Gardens. Heykel Park was opened in the name of Princess Ingrid Alexandra. 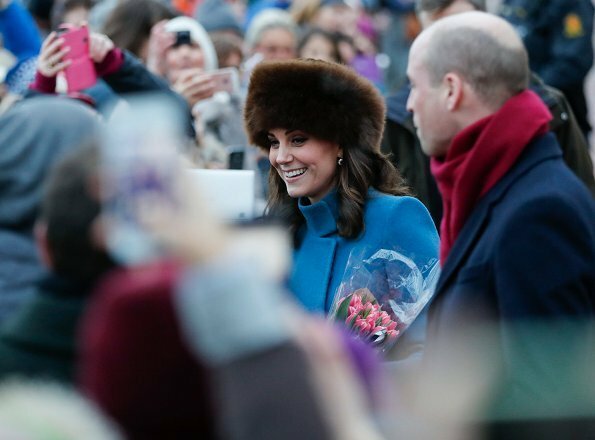 The Duchess wears a jacket by Catherine Walker and a maternity dress by Seraphine brand. 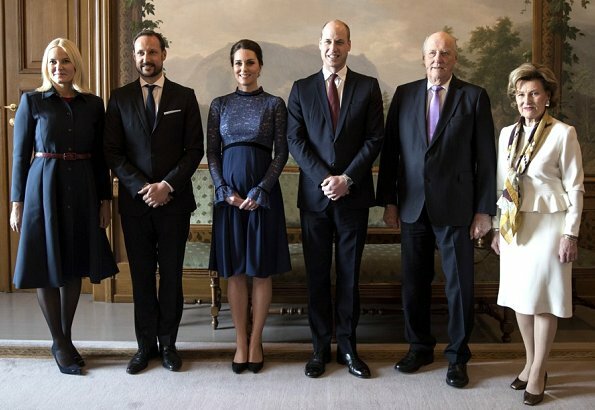 You'd never guess that MM & Haakon were a decade older than Kate & William. Love the coat, hat and boots, not so much the dress. Very, very flattering photos of Catherine. I think that Catherine has saved her best clothes for Norway tour. Much better than in Sweden. Mette-Marit looks also very good. 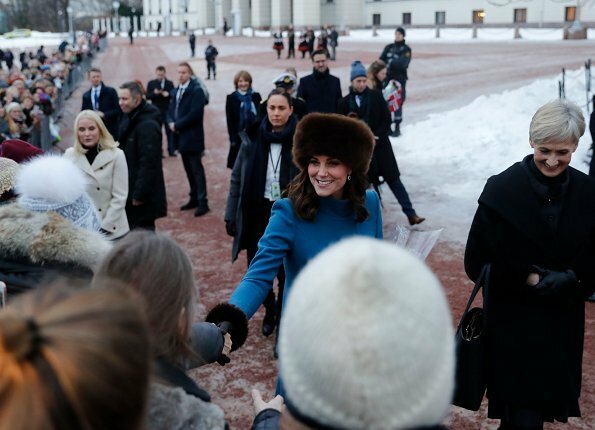 Catherine wears clothes same style as Mette-Marit. Great on her. Het spijt uit de grond van m'n hart: stop hiermee. Wat een vertoning. De monarchie van de toekomst. Als u nu eens stopt met deze betuttelende oude mannen opmerkingen, dan was het hier een stuk aangenamer. 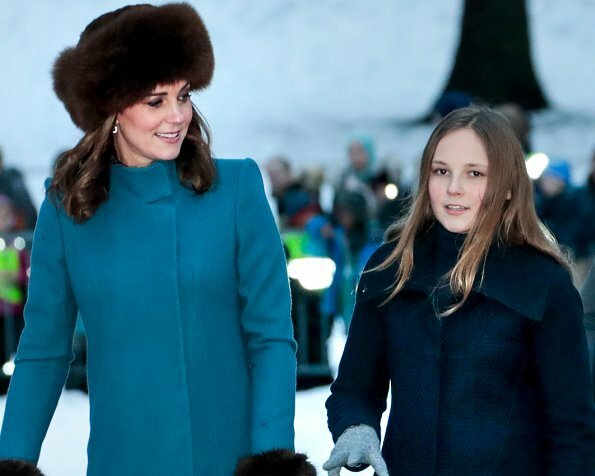 Gorgeous choice of both dress and coat by Catherine. And her hair looks nice too letting us see those pretty earrings. Mette Marits dresscoat looks okay outdoors with the scarf, but as a dress it looks rather like something my grandmother used. Come on. MM still have her coat on as she always have on these pictures. Everyone can see she has a dark red dress underneath. Then I'm really confused. Why would she wear the white coat on top of another coat when in the park? Or did she change dress? I do think the navy blue is a coatdress. It's not a bad one. The fit is nice, I just think it needs something to give it interest, like the scarf did. But that's just based on what I observe in the picture. I could be off. She changed when they went out to the park. She had a dark red dress on when she went to the airport and at lunch underneath the coat. On these pictures you can see a little of it in the neckline. Blow up picture nr. 3, 4 or 6. Very nice. 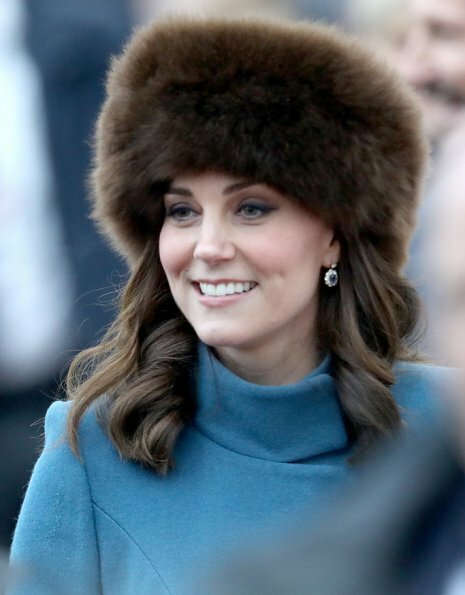 Kate looks elegant and her hair is great. MM looks nicely tailored and the Queen shows how to wear a suit and look really sharp! Nice winter forest backdrop in the airport photo. 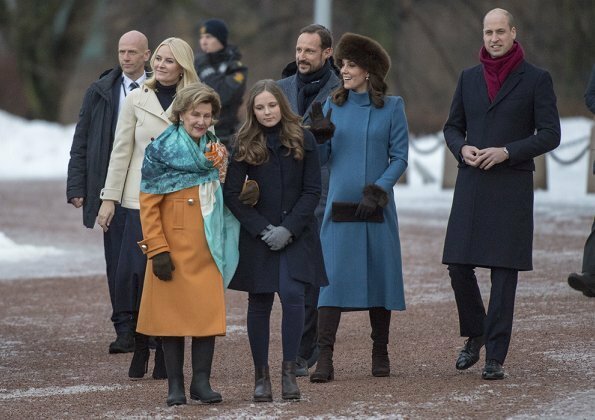 Everyone looking nice here, but I´m surprised to see Mette-Marit only with a coatdress, both inside and outside. Wouldn´t you want a warm coat for outside to throw over the dress, even if it´s a coatdress? No coatdress. She still have her coat on. Where have you people been? MM always have her coat on at these pictures. Look in tbe archives and you'll see this. They are taken right after they arrive. It´s a coatdress, and a fairly typical one at that. If it was a proper winter coat, she´d take it off once indoors. But it´s not intended to be taken off, and she didn´t, even though she has something (other than underwear) underneath. Well, we´ll have to agree to disagree here. What she wears on other occasions is somewhat irrelevant, but since you´re making it your point, I´ll say that there is a difference between a dressy jacket that´s ok to wear indoors (like a suit jacket or a blazer), and then there are winter coats that are exclusively for outdoor use (and it would be rude to leave them on indoors as if one was ready to leave anytime). It is ok to wear a coat over a jacket, but not a coat over a coat. And now coatdresses - dresses that look like a coat (because they resemble a coat in that they are either buttoned/zipped all the way down or wrapped around like a robe, most of the time secured with a belt. And yes, you´d often wear something underneath. A coatdress is, however, not intended to be taken off, and in fact, it would look utterly silly if undone and worn open. 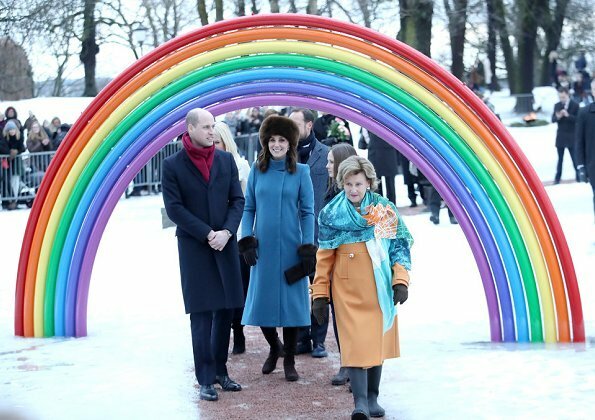 Mette-Marit´s outfit clearly falls into that category, in my understanding anyway, but more important than defining what it is, is the fact that she looks good. It´s a good style for her and she should dress like that more often. So what do you say then that we saw Cathrine in her coat button up sitting in the living room at Skaugum? 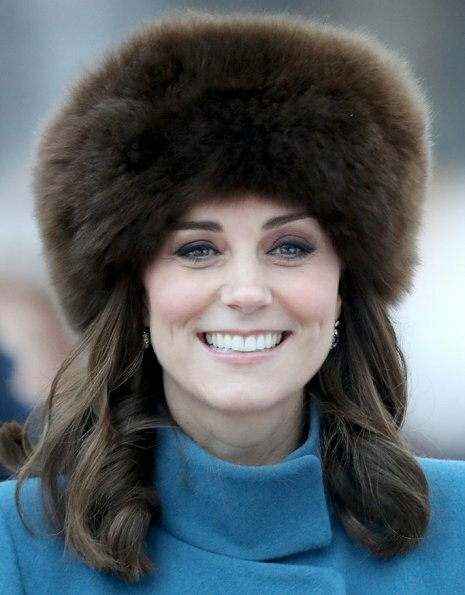 WOW and stunning look of the Duchess. She is absolute beautiful. Photos 7, 8 and 10 stunning. She looks like a russian princess in a movie! Amazing! Lovely coat. But I thought Catherine was given birth in late January? I think that Catherine has saved her best outfits for Norway tour, much better than in Sweden. Mette-Marit looks also very good. I like the way Haakon and Mette-Marit give space to Ingrid that she can chat with Catherine. Ingrid seems to be a very lovely girl. 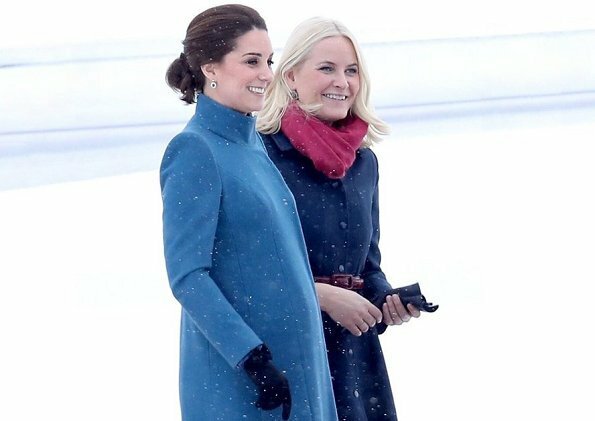 Mette-Marit seems to be trending toward solid color outfits, which can serve as a background for a colorful scarf or jacket. She also has a 14 year old daughter who may coax her into more interest in fashion; we shall see. DoC and MM both look great! 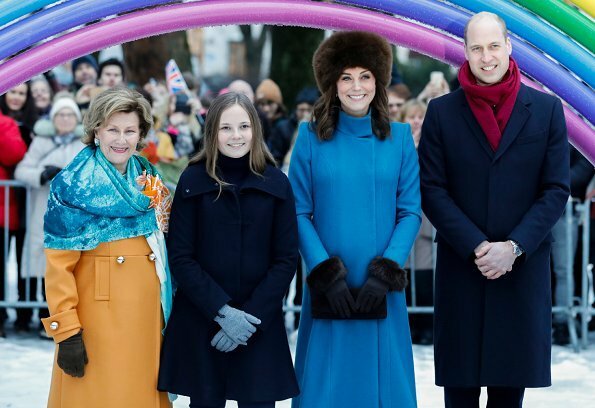 I love Catherine's blue coat, and my one caveat would be that her dress is a bit formal for a morning meeting. But then, I have never flown into Norway to meet its royal family, so what would I know!? Very fun bunch of pics to see. 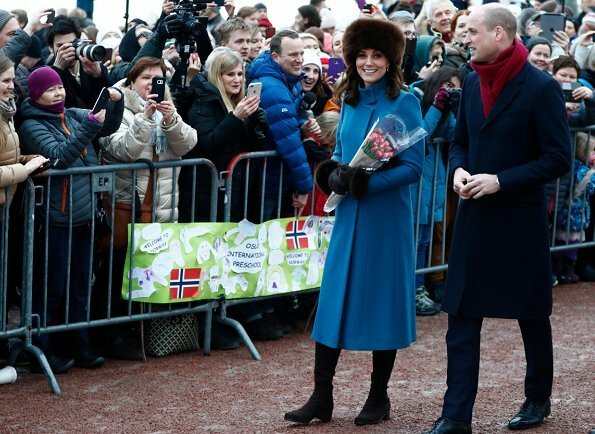 With the blue dresses on this trip, Catherine and I have the same taste. For the other colors, our tastes vary. Interesting. The baby has 'popped' as Americans say, I hope she will stop cradling the baby in future photos.